The museum is officially opened since March 2009 to commemorate the 27th anniversary of the one and only vector based home arcade system - the GCE Vectrex. Any informations, inputs, contributions or anything related to Vectrex system will be greatly appreciated - please contact us. The Vectrex "Brings Real Arcade Play Home" is a self-contained transportable 8-bit videogame unit that displays unique vector graphics on a built-in 9 x 11 inch diagonal monitor. These vector graphics, which are essentially lines of light, have a timeless appeal that typical raster graphics, which consist of small pixels or blocks, can't duplicate. 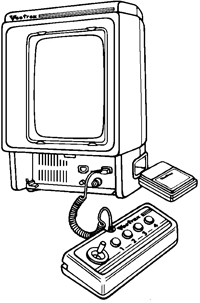 Read more about the Vectrex system. The Vectrex was developed by Western Technologies/Smith Engineering. It was licensed and distributed first by General Consumer Electric (GCE), and then by Milton Bradley Company after their purchase of GCE. It was released in November 1982 - Milton Bradley aka MB took over international marketing. The Vectrex was also released in Japan under the name Bandai Vectrex Kousokusen. More about the Vectrex history. The Vectrex is a masterpiece of design. The control panel, which features a small self-centering analog metal joystick and four numbered action buttons, could be placed in a storage area at the bottom front of the console. The coiled cord would be wrapped once around the joystick, with the remaining length laid on top of the action buttons. The control panel could then be slid into the tabs at the bottom of the console and snapped up into place, creating a sleek forward-facing profile. Unlike other video game consoles, which connected to televisions and rendered raster graphics, the Vectrex has an integrated 10 inch monitor which displays vector graphics. The monochrome Vectrex uses screen overlays to give the illusion of color. At the time, many of the most popular arcade games used vector displays, and GCE was looking to set themselves apart from the pack by selling high-quality versions of games such as Space Wars and Armor Attack. Vectrex comes with a built in game, the Asteroids-like Mine Storm. More about the different Vectrex games. It used the speedier and more advanced Motorola 68A09 (6809) instead of the cheap MOS Technology 6502 8-bit microprocessor found in early Apple, Atari and Commodore computers. Likewise, its sound generator, a General Instrument AY-3-8910, supported a competitive three simultaneous channels of sound with a dynamic range of effects. The chip had been used in Mattel's earlier Intellivision (1980) and would show up in the Atari ST (1985) and other computer systems. 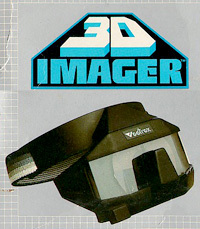 In early 1984, a 3-D Imager (headset) that simulated color was introduced and released in limited quantities. The 3D Imager came bundled with 3D Mine Storm - now in color with the use of the included color wheel and with obvious 3D enhancements. The Vectrex light pen, which plugged into the second controller port and came bundled with the Art Master cartridge, allowed direct drawing and interaction on the Vectrex monitor. Other light pen software released included AnimAction, a more advanced drawing and animation program with included clip art, and Melody Master, a music education and composition program. The 'Father of the Vectrex' was Jay Smith together with his companies Western Technology and Smith Engineering. The idea for a 'mini- arcade' was born in the early eighties, initially thought with a 5-inch monitor. Smith and co. in July 1981 went with it to Kenner, but this company didn't like it. But General Consumer Electronics (GCE), known because of it's game & watches, was enthusiastic and wanted to cooperate with Smith, on condition that a bigger monitor would be used. And that's how, after code names like HP-3000 and Vector-X, the Vectrex with a 9-inch screen was born. Manufacturing of the newcomer among the game consoles started in the summer of 1982 and in November 1982 the first Vectrex consoles appeared in American stores. Now, for 199 dollar, the consumer could create his own arcade. Smith Engineering briefly considered designing a handheld version of the device in 1988, though the success of the Nintendo Game Boy made such a project too risky. In the mid-1990s, Smith Engineering condoned the duplication of the Vectrex system image and cartridges for non-commercial uses and has expressed joy to see that it has still-thriving developer and user community. Subscribe to our "Last Minute" RSS feed if you like to get updates on the latest Vectrex collectibles at eBay.